Staying put. US median years spent at job, by age groups. 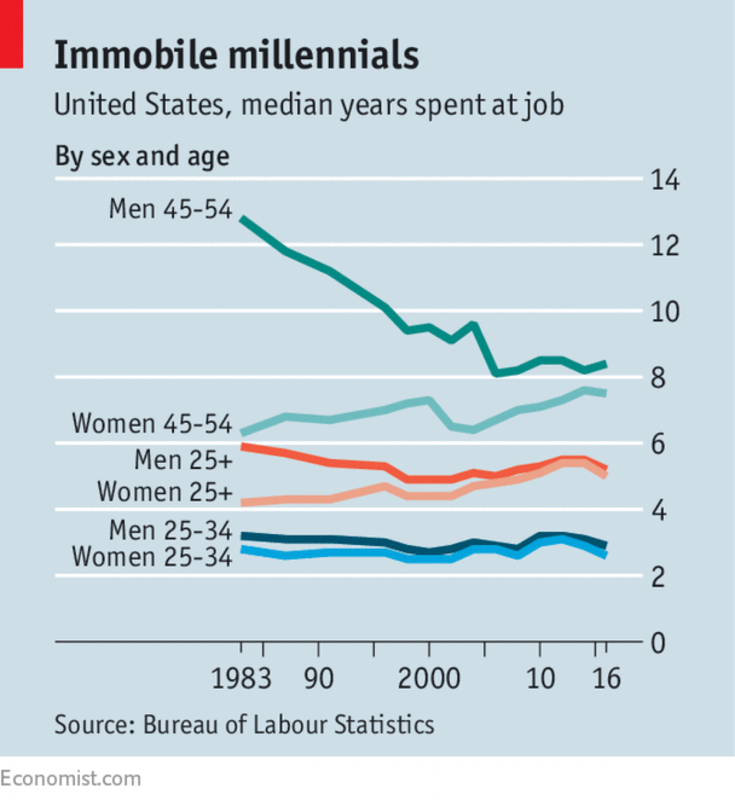 US job mobility is shifting and millennials are job hoping less often than their parents or grandparents, contrary to what the media portrays. This report by The Economist shows it’s the middle aged workers (45-54 aged men) who are job hoping more often than any other age group. If fact, all other age groups are staying put in their jobs as much as in the past and their overall tenure has barely budged. Combined, American workers are spending a median of 5.1 years at their jobs, almost as much as what they did in early 1980s. Shift in manufacturing, advances in automation, and fall in unionized workers have made middle aged men more vulnerable. Men aged 45-54 have job tenures of 8.4 today compared to 12.8 years in 1983. However, women compensated for this trend by staying longer with their employers. Millennials men, those born after 1982, spend 2.9 years at their jobs compared to 3.2 in 1983. The report also says about 12% of American workers moved their home last years compared to almost 20% in the 1950s. Younger worker movement is also down almost 5%. Cost of education is at record high and unpaid student loans recently hit a peak of $1 trillion. That will surely force people to stay put. Additionally in US, healthcare is tied to employment, forcing workers to find a footing before taking a plunge in their current job. Geographically, concentration of high tech jobs to certain areas should also contribute to reduced mobility. The rust belt cities of midwest, historic hubs of American manufacturing, are also not attracting that many workers anymore. As life spans increase, population growth declines, and the nature of work shifts towards more automation and new technologies appear, the trend should shift to more mobility.